De Vijverberg opened on the 4th of September 1954 with a match between De Graafschap and Fortuna ’54. The stadium counted with a capacity of 12,000 at that time, though mostly standing. Over the years, De Vijverberg underwent several changes with redevelopments in the 1960s, 1980s, and early 1990s. By the late 1990s, the stadium had severely aged though, and in 1998 the club started a major redevelopment program. Over a period of two years all stands got demolished and reconstructed. Works were completed in the summer of 2000. In 2007, a small renovation further increased capacity, and one year later, in 2008, the club decided to convert part of the seats into a standing section. In recent years, De Graafschap has been considering a move to a new stadium with higher capacity, however in the end could not get approval from the local council. The club will now investigate the options to improve De Vijverberg. Stadion De Vijverberg is located in the south-east of the small city of Doetinchem. The stadium lies about a kilometre from the city’s railway station, making for a 15-minute walk. The walk from the city centre, lying north of the station, takes only 5 to 10 minutes longer. Regular trains run between Arnhem and Doetinchem. The journey takes about half an hour. By car, from the A18 motorway (which branches off the A12 Utrecht-Oberhausen), take exit 4 Doetinchem-Oost, and turn left onto the N317. At the second set of traffic lights turn right onto the Terborgseweg. After about 400 metres turn right into the small street Esdoornlaan. Follow for 300 metres until the T with the Lijsterbeslaan. Turn right. The stadium will be on the left side of the road after crossing the railroad tracks. Tickets for De Graafschap games can be bought online, at the club office at the stadium, or at one of the Ticketbox sales points. De Graafschap regularly requires possession of a De Graafschap Club Card to be able to buy tickets. While De Graafschap sells out regularly in the Eredivsie, tickets should be easily available for most Eerste Divisie matches. Ticket prices range from €20.50 for a seat in the corners or behind the goal to €25.50 for a central seat at the long side. 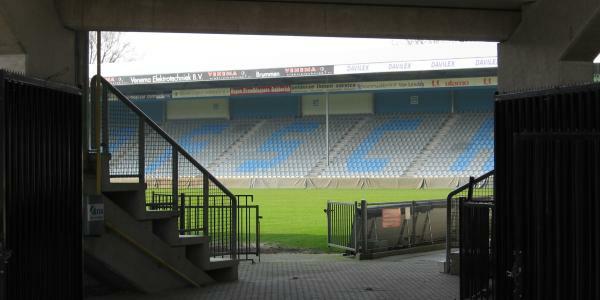 De Graafschap offers guided stadium tours that include the dressing room, players tunnel, and press room. The tour takes about 60 minutes. Contact De Graafschap by email info@degraafschap.nl or phone +31 (0) 314 368450 to find out about specific dates and hours. The tour costs €6.50. Degraafschap.nl – Official website of De Graafschap. Vvvdoetinchem – Doetinchem tourist information.